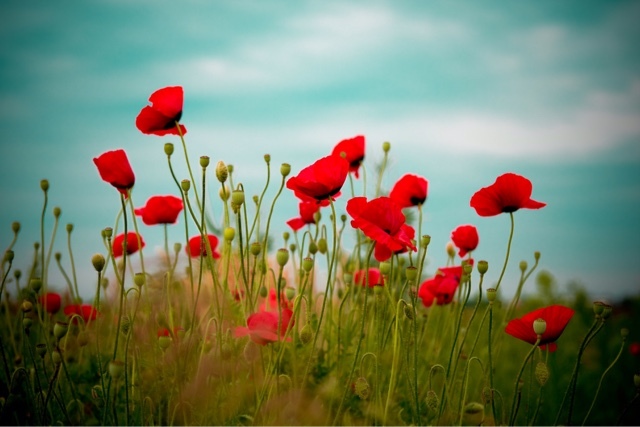 This is the story of how the poppy came to be known as an internationally recognized symbol of Remembrance. The scope of the poppy and its connection with the memory of those who have died in war has been expanded to help the living as well. Funds continue to be raised to support those in need of help, most especially those suffering from physical and mental hardship as a result of war. In recognition for financial support of any amount a single red poppy pin would be given. In my hometown of Surrey in the lower mainland of British Columbia you would be hard pressed not to know it was on or around Rememberance Day/November 11th as the cheery red bloom would don almost every coat, scarf and sweater. Similar to the Salvation Army ringing the bell at Christmas, veterans and volunteers would flood public places exchanging poppy pins for donations. My parents would always make a donation and receive a poppy pin or two. After wearing it on her lapel, my mother would affix it to the visor of driver's window of our car. We remembered long after November 11th as with each ride in the car it greeted us until it became a dusty faded version and therefore was replaced on an annual basis. Each November 11th my father would flawlessly recite the beloved Canadian poem as my sister and I would at least try to be a cooperative and attentive audience of two. To this day the first stanza of the poem is etched in my memory in my father's voice. The sight of these delicate, vibrant red flowers growing on the shattered ground caught the attention of a Canadian soldier named John McCrae. He noticed how they had sprung up in the disturbed ground of the burials around the artillery position where he was positioned. It was during a warm day in early May 1915 near the Ypres-Yser canal where he is believed to have composed the landmark poem following the death of his friend, a fellow solider. The first lines of the poem have become some of the most famous lines written in relation to the First World War. I remember. Thank you, Mom & Dad for instilling the meaning to this day. Home of the free because of the brave. Thank you to those who serve, have served and the loved ones affected by it. I am grateful.